Besides the candies and costumes, another reason for my love of Halloween is the fact that it happens during pumpkin season!!! Alright, I gotta admit, I was NEVER a fan of pumpkins. Say the word “pumpkin” and I’ll run. It wasn’t until last year that I discovered the wonders of pumpkin desserts when I made my first pumpkin cheesecake! Since then I got hooked on everything and anything pumpkin. The recipe Jin gave me was originally the Libby’s Pumpkin Roll recipe found at the back of the can label. Although the cake turned out “okay” and I didn’t have any problems with a rolling it up, I didn’t quite enjoy the texture of the roll as I found it to be more similar to that of a quick bread than that of a cake. It lacked the softness and sponginess of a cake. Upon further inspection of the recipe, I noticed the absence of oil / butter! Although in North America, we usually call these cakes “cake rolls” or “jelly rolls”, in most Chinese bakeries, the rolls are known as “Swiss Rolls”. They’re usually cotton soft and really fluffy, often employing the separate eggs “chiffon” method. And that’s how I wanted my pumpkin roll to turn out! I didn’t want to alter the recipe too much since I was afraid of the cake cracking upon rolling it up. After experimenting with the recipe though, I realized that although my cake DID turn out a lot softer with the “chiffon” method, it also cracked upon the roll up. I realized that the cake had became too thick to roll without cracking. Thus, I decided to try omitting the baking powder / soda, and hey whatdya know!! 😀 😀 😀 I’m guessing you could also add more eggs OR reduce the batter added to the pan to ensure a thinner cake. But I’ll stick with this recipe for now since it turned out wonderfully! Preheat oven to 375° F. Grease 15 x 10-inch jelly-roll pan; line with parchment paper. Grease and flour paper. Sprinkle a thin, cotton kitchen towel with powdered sugar. Combine flour, cinnamon and nutmeg in small bowl. Beat egg yolks with 1/4 cup sugar until light and creamy. Add milk, oil and pumpkin. Mix well but do not overmix. In a separate clean bowl, beat the egg whites on high speed and add the remaining 1/2 cup sugar in three parts, until it turns glossy and stiff peaks start to form. Take 1/3 of the egg white mixture and mix it with the egg yolk mixture. Stir in 1/2 of the flour mixture followed by 1/3 of the egg white mixture, the remaining half of the flour mixture, and finally the remaining 1/3 of the egg whites mixture. Please be gentle with your batter and be careful not to overbeat! Spread the batter evenly on the prepared pan and sprinkle pumpkin seeds on top. Bake for 11-13 minutes or until top of cake springs back when touched. Loosen and turn cake onto a parchment paper that has been prepared by sprinkling it with powdered sugar. Carefully peel off paper. Roll up cake and parchment paper together, starting with shorter end. Cool on wire rack. BEAT cream cheese, powdered sugar, butter and vanilla extract in small mixer bowl until smooth. Carefully unroll cake. Ensure that the cake has been cooled at this point. Spread cream cheese mixture over cake. Reroll cake. Wrap in plastic wrap and refrigerate at least one hour. Sprinkle with powdered sugar before serving, if desired. Success!! Honestly the “rolling” stage has always been the most stressful aspect for me. And it really pains my heart to see the cake crack because you know there’s no turning back once that happens! Good thing this did not take up too much time! So there ya go! 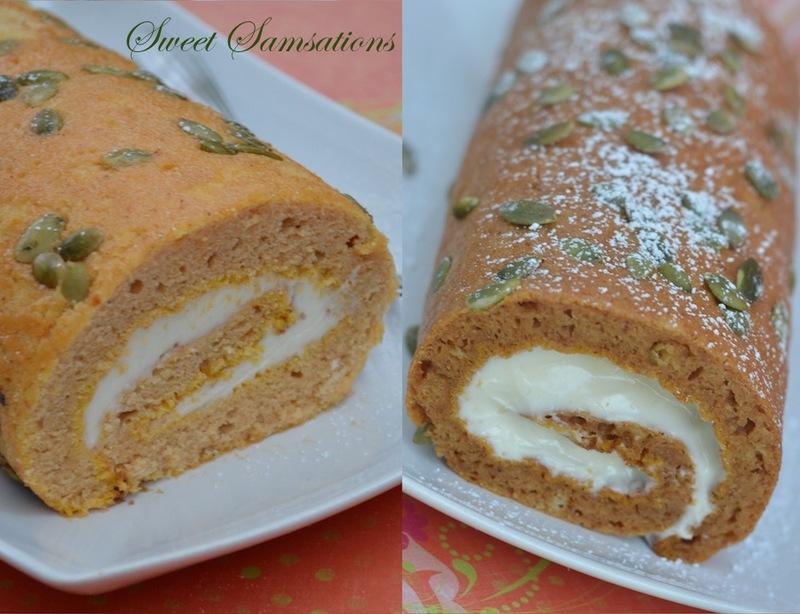 A soft and fluffy Pumpkin Swiss Roll! If you’re interested in seeing what I made last year, please see…. Happy Halloween Guys!!! Stay safe! I pray for those located close to where the cyclone Sandy had taken its toll. Hopefully you and your families stay safe!!!! ❤ Especially my blogger friends there! I will be reading updates! Oh my gosh! I was just planning on making this! Even bought majority of the recipe this past weekend! Yours look awesome, now I know where to go for reference! And the carved pumpkins rock! Loving the look of this pumpkin beauty, tasty, festive and nutritious in there somewhere to boot! It looks pretty and so delicious! 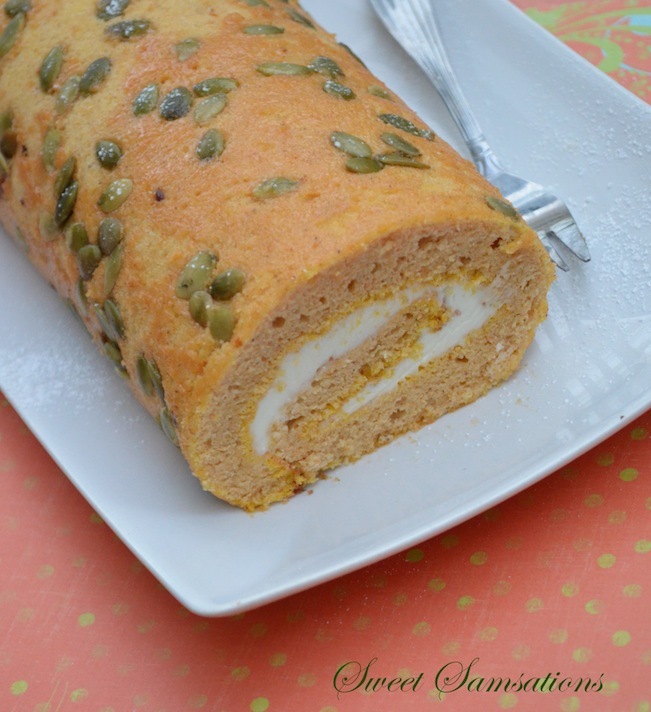 Beautiful swiss roll and it’s pumpkin flavor! Come to think of it, I’ve never had pumpkin and cream cheese together. Sounds like an excellent combination. Wish I have a slice (or even more…). This is a beauty! I think I missed out on celebrating Halloween with this…it would’ve been perfect! I’ve been dying to make one of these! Yours turned out perfectly!! That was totally the same as me. I never liked pumpkin, until I tried a pumpkin spiced latte at Starbucks.. Then I was hooked. This looks fabulous! Gorgeous roulade just like all of your other baking dishes! Love the carved pumpkin. This sounds wonderful! 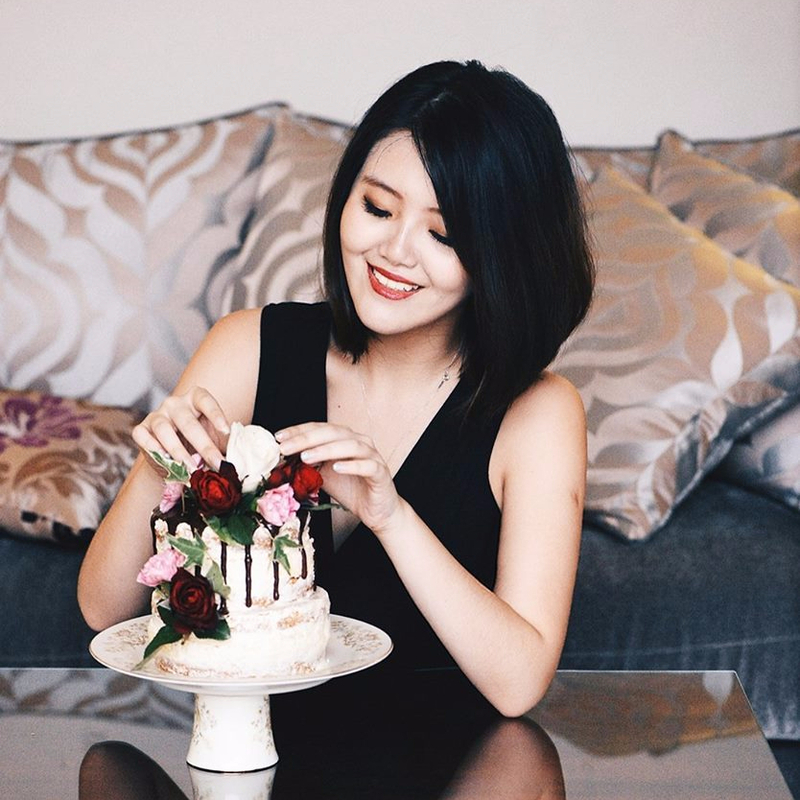 And good for you perfecting the recipe by making your own tweaks and changes – you are such a natural at baking! Garnishing with pumpkin seeds was a nice touch. That is one beautiful cake roll. 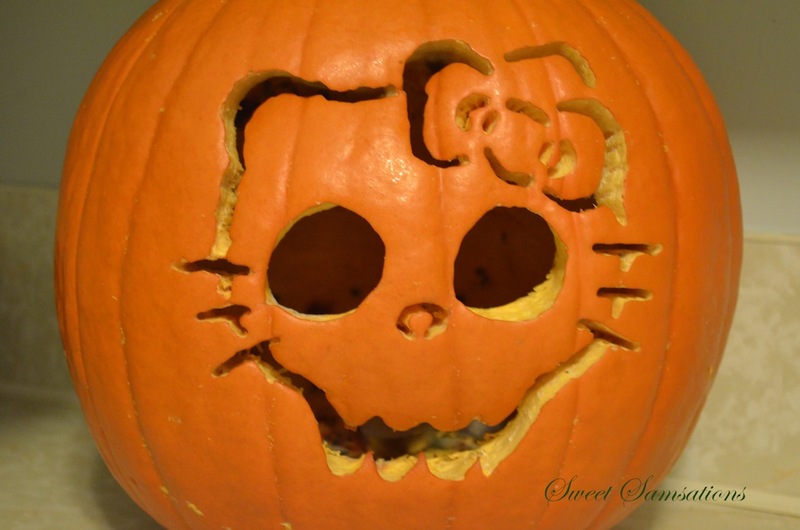 I like how you decorated it with pumpkin seeds, too. A perfect dessert for the upcoming holidays. 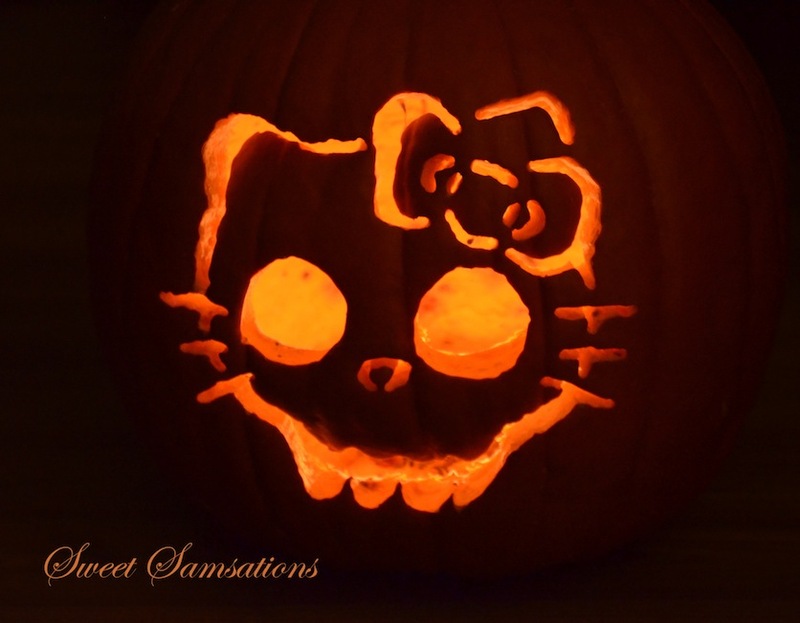 Hello Kitty Pumpkin is both adorable and terrifying. I LOVE pumpkin rolls!!! I’m actually afraid of them though. The rolling takes skill. Giiiiirrrrl you are masterful!!! 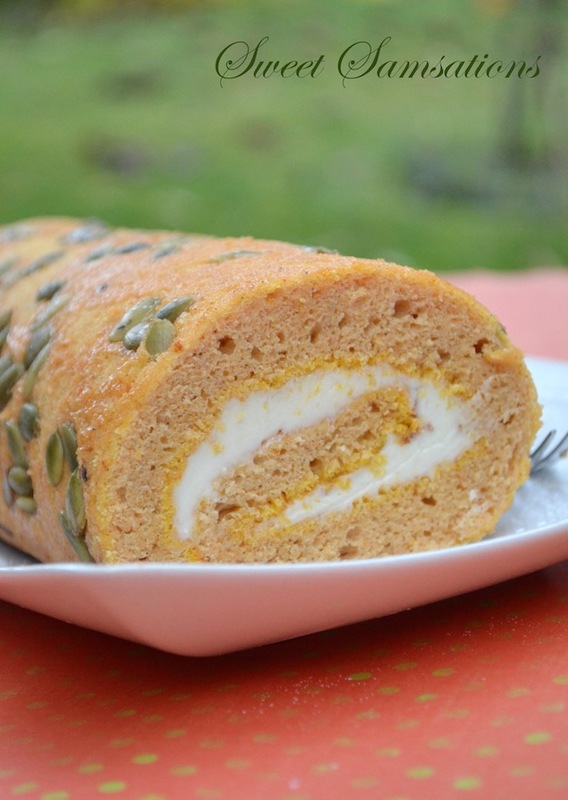 Nice pumpkin roll, love it…especially with the cream cheese filling. Beautifully done Sammie! pumpkin and cream cheese, sound like a good combo! I love anything pumpkin and get super excited for pumpkin season. This pumpkin roll looks delicious. I love the combination of pumpkin cake and cream cheese. Oh, goodness! 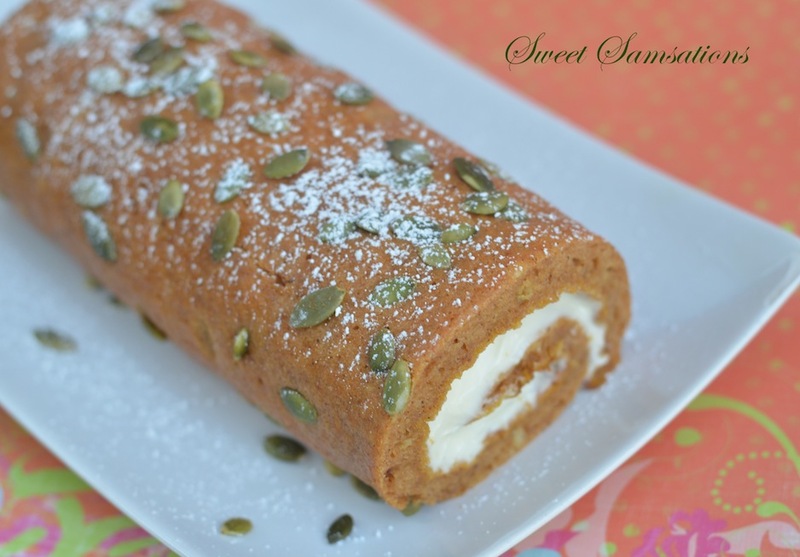 Pumpkin rolls have been on my to-do list, but I can’t find my jelly roll pan. I’m buying a new one, pronto! I love the added seeds. Beautiful as always!